Some of the most attractive features of the covers include the lockable lid (with key) and push button lock, which secures your load whilst keeping items protected. The covers themselves are also tough with an extremely hard wearing checker plate surface, creating a second work area that is capable of handling tools and material. The Aluminium Tonneau covers also open on a wide angle for easy access to the tub. Another appealing feature is the gas struts which provide effortless opening, quick release hinges and a pull-down handle to aid closing. Available for double cab only. 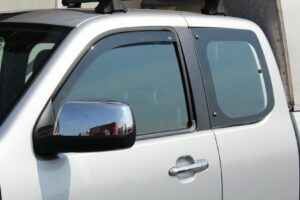 Side and Cross rails to suit the tonneau cover can be purchased at the checkout.